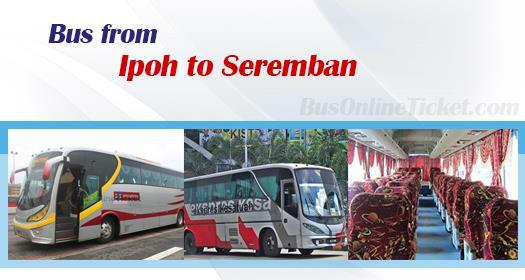 Bus from Ipoh to Seremban remains as an important mode of transport today in connecting the two cities. Even under the stiff competition from the popular train services in Malaysia, Electric Train Service (ETS) provided by KTM, bus stays relevant by offering frequent schedule with convenience to passengers. Kesatuan Express and S&S International Express are the two bus companies offering direct bus from Ipoh to Seremban. Locals prefer this two bus brands because of their punctuality. Besides that, they are well-known in providing comfortable bus journey too. Their combined trips have total 5 daily trips for this bus route. The first bus starts at 11.00am. The subsequent bus schedules are at 8.00pm, 11.15pm and midnight 12.30am. In fact, the bus schedules are slotted between the empty slots of ETS train schedule in order to complement each other. With ETS train schedule at 9.20am, 3.50pm and 10.47pm, passengers have almost round the clock combined train and bus schedules to choose from. The duration required for bus from Ipoh to Seremban is approximately 3.5-4 hours, depending on the traffic and climate conditions. The bus fare is affordable charging in the range of RM 25.10 to RM 28.00, depending on the choice of bus operator. At least 1 washroom break will be provided during the journey. The location for departure in Ipoh is at Aman Jaya Bus Terminal. Passengers who live in Ipoh city area need take a 20 minutes ride to Aman Jaya Bus Terminal because it may be slightly away from the city area. The location for arrival point is located at Seremban Bus Terminal One. Please visit BusOnlineTicket.com to make your booking online to get instant confirmation upon payment. Passengers are advised to book their bus ticket in advance through our online booking portal because seats are very limited, especially during peak season.